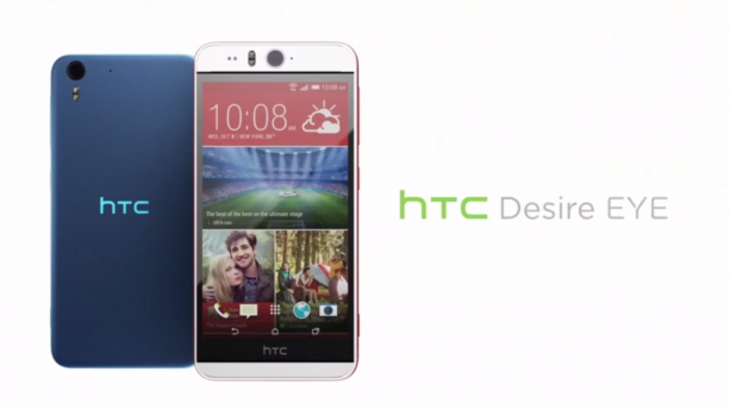 At its HTC Double Exposure event, HTC introduced its newest smartphone, the Desire Eye. The new phone comes with a 5.2-inch HD 1080 x 1920 display with 424 ppi and has the same 13MP wide-angle camera on the front and back of the device. Both lenses also have dual-LED flashes, so no more dark seflies. The phone has a unibody construction with a plastic case that’s IPX7 waterproof up to 30 minutes in one meter of water. It also sports front-facing HTC BoomSound Speakers. The phone comes in two two-tone trims (white with orange trim and dark blue with light blue trim), is 8.5 mm thick and weights 154 grams. 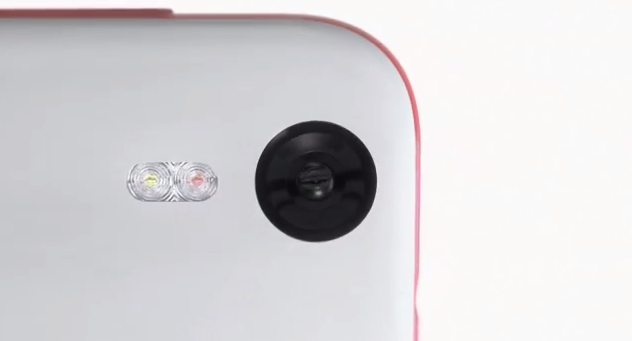 It’s powered by a quad-core Snapdragon processor and 2GB of RAM. The phone ships with HTCs new Eye Experience camera software that has an Voice Selfie feature that understands voice commands. “Say Cheese” and it snaps a photo. Say “Action” and it starts shooting video. There’s also a Live Makeup feature that where you can smooth your skin and a Face Fusion feature lets you see what happens when you cram two faces together. Helpful when you want to see what your potential baby will look like with your significant other or Ryan Gosling. Plus, you can also take photos with the front and back cameras and super impose your selfie over the image taken by the back camera using the Crop-Me-In feature. It’s like a composite selfie. The camera software knows where to crop you out of the front photo and you can just overlay that photo on the composite. The Eye Experience software is rolling out HTC devices today. The HTC Desire One is currently only available via AT&T in the US this month. It will also be available in Asia and EMEA this month.